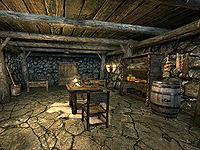 Pavo's House is the only house connected to Kolskeggr Mine, a gold mine east-northeast of Markarth. It is the home of local miners Pavo Attius and Gat gro-Shargakh. It consists of one area only, Pavo's House. Due to an attack by Forsworn, the inhabitants were forced to flee their home and take refuge in the neighboring Left Hand Mine. 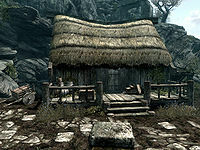 They will move back to the house and Kolskeggr Mine when the quest of the same name is completed. The house consists of a ground floor which is mostly empty and a basement where Pavo and Gat sleep when not working in the mine. The front door opens to the sight of a huge crate on the table with a pickaxe on top. Another pickaxe is leaning against the eastern wall, next to two food barrels. A broom stands in the southeastern corner. Otherwise, the room is completely empty. The basement is clearly where the inhabitants spend their time, as it is clean and more furnished than the empty room upstairs. At the foot of the stairs is a food barrel and, hanging above, two rabbits and two garlic braids. Next to the barrel is a set of shelves with plenty of food, including four loaves of bread, some sliced goat cheese and an eidar cheese wheel. Also on display are two potatoes and three heads of cabbage. Adjacent to the shelves stands a small table with a single bottle of alto wine while a cooking pot is ready in the corner. Two beds stand along the eastern wall, separated by a huge wardrobe with various clothes. None of the items in the house are unowned and free to take; the beds are owned by the Pavo and Gat factions (making them unusable). This page was last modified on 18 December 2017, at 05:07.